Although our Power Hour training materials are designed in detail so that anyone can use them, we realise that developing training and facilitation skills is useful to many managers and HR people. That is why we offer two 'Train the Trainer' options to clients who want extra support to use our training materials. A one day workshop is ideal for those with SOME training experience, although this experience may be limited or 'lapsed'. It is also useful for more experienced trainers in a company where there is a lack of consistency of approach. In this workshop, we review learning/training theory and accelerated learning principles. However, the main focus is on using the training materials, facilitating activities, discussion and role plays, and gaining commitment to action. Participants get chance to practice some the skills, using the Feedback Power Hour training materials. This workshop costs £950*, regardless of the number of delegates. A detailed outline of the workshop can be downloaded here. 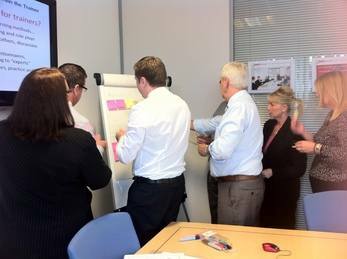 A 2-day workshop is ideal for those with NO previous experience of running training events. It starts from the basics of understanding how people learn, and explains why the Power Hour training materials have been designed as they have. Practical skills such as preparing to train, presenting, managing discussions, facilitating activities, managing role plays, giving feedback and summarising will also be covered. Delegates will have lots of opportunity to practice using the Power Hour training materials themselves and revieve feedback and coaching before they 'go live' and run their own sessions. This workshop costs £1750*, regardless of number of delegates. A more detailed outline of the workshop can be downloaded here. * This is the trainers fee. Expenses relating to travel, accommodation and materials production will be recharged at cost. VAT at the standard rate applies. You can see more photos by visitng our Facebook Page.